For most people – especially growing families – the go-to segment for a new vehicle is often an SUV. They’re practical, safe, have loads of space to store your stuff, and place fuel efficiency at the forefront of their utility. However, more and more families and individuals are turning to the big brother of the SUV – pickup trucks are another great alternative to the quintessential SUV or crossover vehicle for more reasons that you may think. In this post, we’ll cross compare trucks and SUV’s in a number of categories to help you assess what’s the best choice for you and your lifestyle. When it comes to storage space and utility, the pickup truck will always be king. Having a truck bed to store your stuff – bikes, strollers, landscaping materials, groceries, the dog, etc – all fit easily in the bed of your truck. With the purchase of a lockbox, tonneau cover, or truck cap, a pickup easily becomes a weatherproof, lockable solution for those looking for above-average utility. There’s ample legroom in a truck, while most of the cabin room and storage solutions are reserved for the front passenger’s. Accessibility can be an issue for shorter people, but again – accessories save the day. Running boards and sidesteps are easily installed and are relatively inexpensive. Meanwhile, SUV’s shine for their practical nature. Nothing spells frustration like trying to park a mammoth full size pickup truck in a cramped space. SUV’s are specifically designed to be as innovative as possible, with many featuring flat-folding near seats to accommodate large loads. They also boast unique user-friendly perks like large accessible hatches and shorter wheel bases that allow for a tighter turning radius and easier parking. Some SUV’s also feature available third row seating, a huge benefit if you’re looking to accommodate a growing family. ADVANTAGE: TRUCK – for their advantages in standard cabin space and utility. Here’s where things get a little tricky. SUV’s pride themselves of their dedication to the environment, designed to use as little fuel as possible given they are not small vehicles. Average fuel efficiency for a mid-size SUV like a 2017 GMC Acadia, for example, rings in at a respectable 11.5 L/100km combined. Many SUV’s also feature an eco-mode, and offer smaller displacement turbocharged engines to limit fuel consumption. Truck’s, on the other hand, have never been known as fuel-sippers. Most trucks are targeted to those who use them for hauling and towing – meaning that their rear end differentials and gear-ratios are equipped to produce maximum torque. These days, many trucks feature cylinder-deactivation when cruising to help reduce fuel consumption, and smaller displacement mid-size trucks like the GMC Canyon feature multiple engine choices – all offering different fuel advantages/disadvantages. Diesel alternatives are also becoming a viable option that caters to towing, hauling and fuel efficiency. We’ll be brief here. Both trucks and SUV’s offer a wide array of integrated safety features and award-winning safety crash-test awards in their respective segments. Most new vehicles will offer some forms of available lane departure alerts, forward collision alerts, blind spot alert, a huge number of curtain, side, front, and rear airbags, etc. However, the IIHS notes that a large difference in trucks, historically, has been the lack of electronic stability control in pickups which can limit can limit the extend of a potential skid, or rollover. This is changing as trucks continue to advance, but is still worth noting. ADVANTAGE – DRAW – safety first, all around. 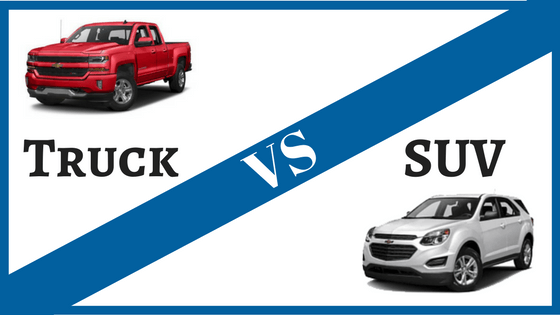 When compared to cars, both SUV’s and trucks are priced higher than standard passenger vehicles because of their popularity and utility. But, they typically require less to insure than the average sedan – trucks specifically. Likewise, an AWD or 4WD system can be much more expensive to repair than a front-wheel-drive hatchback or sedan. When compared side-by-side, let’s consult Chevrolet’s official website. For the advertised 2018 mid-sized Chevy Colorado Crew Cab, the suggested MSRP is $32,520. Meanwhile the 2018 Chevrolet Equinox, a popular mid-sized SUV cites an advertised MSRP of $33,980. For full size vehicles, the 2017 Chevrolet Tahoe, a popular SUV, starts at $47,215 – meanwhile a 2017 Chevrolet Silverado starts at $27,785 – a savings of nearly $20,000. An eye-opening statistic when you consider that the Tahoe and Silverado share many attributes, including engines. On average, trucks are cheaper to purchase than SUV’s given the latter’s popularity in the current marketplace.